Wassail Days 2018 -- It's time to make the wassail! It’s time for Wassail Days in Frisco, Colorado! I’m sticking with my award winning** wassail recipe*** that I introduced last year, so make sure we’re on your list as you wander the streets! **My wassail has not actually won any awards. I’m sorry I lied. ***However, a lot of people did compliment my wassail last year. 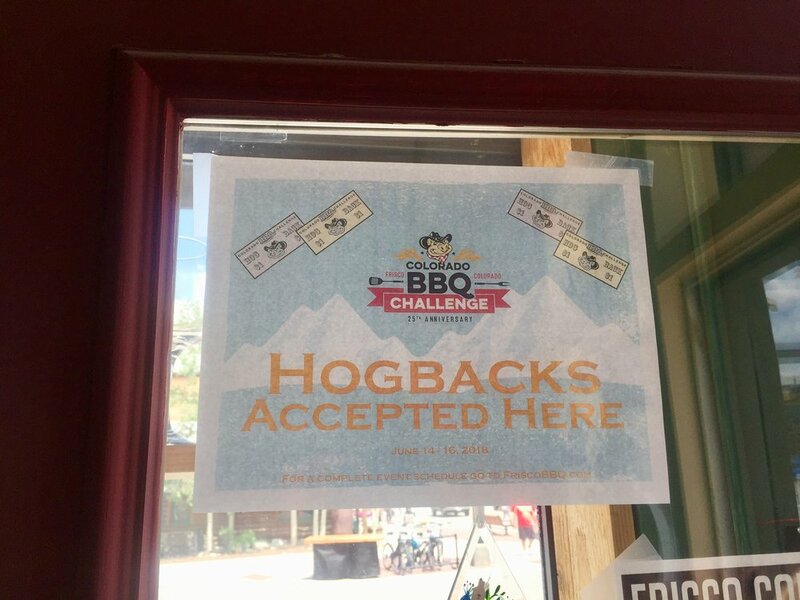 Don't forget to trade in some money for Hogbacks, the official currency of the Frisco BBQ Challenge! If you end up with some Hogbacks left over, you can use them same as cash in several local shops, including ours! Thursday afternoon. Main Street is closed, and bikers and pedestrians meander right down the middle of the road. Vendors are setting up. There is a feeling of anticipation in the air along with the first scents of barbecue cooking. This is one of my favorite times of the year here in Frisco. Okay, I have a lot of favorite times of the year, but I think what I enjoy so much about the Frisco BBQ Challenge is that it represents the beginning of the summer season. Things have been relatively quiet since school got out, but this event kicks off the summer every year with a bang. The BBQ Challenge, in all its madness, somehow feels like what a simple, small town event should be. Walk down the middle of the street, take your time, take it all in. Cool off with a lemonade, some ice cream or a cold beer. Sample BBQ and other delicious foods from a bunch of different vendors lining the streets. See old friends and meet new ones. Sit a while and savor your food and drink at the Historic Park. Just relax and take it all in--the people watching is hard to beat. There are plenty of events going on each day as well. From chef demonstrations to pig races to lots and lots of live music, you won't lack for entertainment. Then, when everything winds down at 6 pm on Saturday, several local restaurants are holding a special happy hour from 6-8 pm. Many of our Main Street restaurants have lovely patios or decks to sit and have a drink and a bite to eat as the day cools off. If you're in town on Friday and/or Saturday, and you happen to get the opportunity to come back on Sunday, I have to recommend that experience as well. I am always shocked by the difference between what the place looks like when I leave on Saturday evening and when I return again on Sunday morning. The cleanup efforts are truly impressive. On Sunday, Main Street Frisco is transformed back into its normal adorable self. Many people think of Summit County's resort areas as primarily for winter skiing. What you might not know is that those same resorts are excellent locations to take your family for the ultimate, stress-free family vacation during the summer months as well. Get the kiddos out for a hike! With abundant hiking trails in the area, you can find the perfect day hike for any level. There are numerous opportunities to enjoy day trips to the unique vistas that the mountains provide. Activities such as rock climbing, biking, hiking, ATV trips, rappelling, whitewater rafting, horseback riding and boating are just a small sample of the summer activities that the mountains have to offer. Do a little research online or contact one of our local visitor centers and you'll be well on your way to a great Rocky Mountain adventure. Read on for more information about how Summit County can provide you with the perfect destination for your next family trip. During the summer, Keystone offers a variety of fun family-friendly options. Keystone is also home to Kidtopia, with free daily activities for families such as nature hikes, face painting, arts and crafts, outdoor movies and more. Each year brings expanded offerings, new themes and even more entertainment. River Run Village, which is populated with great restaurants and shops, is a great area for the whole family to stroll around and enjoy a beautiful summer day in the mountains. In Breckenridge, ride the free gondola up to check out exciting activities for all ages, like an elevated roller coaster, a zip line, alpine slide, a maze, gold panning, a climbing wall and a bungee trampoline. In addition you can find guided hikes, 4x4 tours, Segway tours and bike rides. The Mountain Top Children's Museum, which works hard to provide a safe space to explore educational and creative activities, is another great stopping point for younger families. Geared toward children under 10, it has a great staff and quality programming. It even includes an easily accessible Kid's Night Out for parents wishing to have a night out on the town, which is convenient because it is located right in the heart of Breckenridge near shops and restaurants. If you happen to be in Frisco during the Fourth of July, you won't want to miss their legendary town celebration. You can begin the day with a pancake breakfast, follow-up with a local parade, enjoy bands all day long and then finish off with a spectacular fireworks show over the Frisco Bay Marina. But if you miss out on that celebration, Frisco is still a glorious place to spend a summer day. Several hiking trails and recreational paths are located right in town, a free historic park and museum, water activities at the Frisco Bay Marina and many shops and restaurants that cater to younger visitors. Frisco's Main Street is relatively calm and quiet with an easygoing vibe perfect for all ages. With the gorgeous views, the extensive activities, and the family friendly resorts, your family can have a wonderful summer vacation in the heart of the Rocky Mountains.